The NYC tax experts at 212 Tax Accounting Services understand falling behind on your taxes and want to help. The team perfects your taxes, so you can finally feel at ease about your upcoming tax years. The process is mainly handled over the web to ensure not a minute wasted and confirming a clear line of communication via telephone, text, and email. 212 Tax helps secure your taxes and makes sure all taxes are filed efficiently and you’ll never risk falling behind again. 212 saves your time and your taxes. File your taxes correctly with us now! Unfortunately, a resident of New York was improperly advised by his previous accountant who improperly filed his taxes which resulted in IRS consequences. Luckily, Anil (212 Tax) was able to take over, save the day, and file the taxes correctly. The level of integrity and expertise at 212 Tax Accounting protects your taxes to ensure there is no grey area when it comes to dealing with the IRS. The digital-based service allows you the flexibility to view the productivity behind your taxes, so you know where you stand at all times. Check out the website now and let the team take care of your taxes so you don’t have to. me, he’s the first person I send them to. I didn’t receive proper documentation from my employer at the time, and when I submitted my stub things didn’t add up correctly. I received a lien from the IRS and I was extremely scared, that’s when I went to 212 Tax. Immediately when I called 212 Tax they assigned me an accountant to handle everything going forward and they worked directly with the IRS to clean everything up for me. My previous employer failed to claim my state income tax for the final two years I worked there. They called me to let me know the following year, and I was unsure of how to proceed. I knew I needed to pay the taxes I owed, but I didn’t know how to do so accurately. Anil from 212 Tax was able to take control of my situation by directing me to right forms and completing them accurately on her behalf. I’m the CEO of the Amirian Group, and we have been doing business with Anil for the better part of 10 years. We actually had an accountant before that was not up to par and we had the books checked and found errors to the tune of several hundred thousand dollars. Anil at 212 Tax was able to step in and give me the support we needed to grow the business. I got married last year, and while I felt comfortable filing before, I wanted to get professional help this time. After talking to Anil about my unique tax situation he made sure I did everything the right way the first time around. I have been working for myself for four years. I work with TV and film actors and actresses, represent brands and networks. I felt like I needed someone help me understand my numbers. I called 212 Tax and someone answered right away and were able to answer all my questions. I run a real estate company, as well as an entertainment company and Anil had helped to create both of them. It’s been interesting because he is usually more aware of the timelines that I need to be aware of and it’s helpful to have somebody who’s really an adviser part of the team. Almost twenty years now, I’ve been doing different companies. During college I started and he was actually a long time college friend of mine and we work together during the entertainment promotion work. We’ve been working together literally twenty years. As an advisor to my clients, the reason I like to refer them to Anil is because I know that the advice and the knowledge that he’s giving them is accurate because he wouldn’t be giving them any sort of false information. My immediate response upon hearing the word ‘tax’ is to cringe back then, but now I just think, “Oh, I’ll just ask Anil. After your returns are prepared, everything is explained in detail. Anil is very easy to work with. If you are an individual whose returns are a little more complicated than the average Joe, I would strongly suggest 212 Tax. It is an investment worth the money. You will also have the peace of mind using a firm which knows the tax laws and that any dealings with the IRS should always be taken seriously. Everyone at 212 Tax is professional, competent, honest, and pleasant to work with. They explain everything very well and respond timely to calls and e-mails. Anil Melwani and everyone I have worked with at 212 Tax have been extremely helpful. I had to file amendments for a number of personal tax returns and S-Corporation returns for my company, in addition to the current year’s payroll and other tax returns. 212 Tax got my returns straightened out quickly and with very little involvement required from me. Business Owner, New York, N.Y.
212 Tax expertly handles all of my household employee taxation needs. Anil and his staff are highly responsive to my questions and make the relatively unpleasant task of paying household employee taxes as pleasant and easy as possible. Their fees are very fair as well. Highly recommended. Anil is professional, produces a quality work product and instills trust in his relationships. He is someone who will always put his clients’ interests first. If you need an accountant, I strongly recommend engaging Anil to represent your interests. What a fantastic CPA! He really cared about my personal tax debt to the government and took the time to share what I can and cannot deduct. GREAT CPA – highly recommended! Anil took the time to review all of my specific needs for the proper preparation of my 2009 tax return. He followed up quickly and provided excellent service at a reasonable cost. I will definitely be a return customer in the future with his firm. The 212 team is hardworking, detail oriented and will go the extra mile to make sure everything gets done in a timely and accurate manner. Anil has always been very professional. He is trustworthy and possesses all the key attributes of a C.P.A. Anil is someone who will always put his clients’ interests first. I, without reservation, recommend 212 Tax & Accounting Services LLC. 212 Tax continuously saves me money and allows me to focus on the day to day operations of my business. Anil has advised me on countless business decisions on quantitative levels. His knowledge of accounting fundamentals and current economic drivers allows him to advise on a myriad of business issues. Without question, Anil provides a higher degree of service then his competitors at a fraction of the cost. I hired 212 Tax to prepare corporate and personal tax returns. They are very easy to work with and willing to help when I had questions. I highly recommend 212 Tax and will definitely work with in the future. Anil Melwani has all the necessary credentials and has a very professional attitude. He understands that a CPA/client relationship is long term and entails providing sound financial advice as opposed to just filling in a 1040 form once a year. 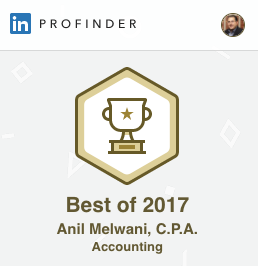 During the initial consultation Anil presented what his firm is able to offer which makes it easy to decide if this is the CPA service for you (and it is). “My accountant of 25 years retired this year and sold his business to a corporate tax firm. Although it would have been less effort to transition to the new firm, the corporate personnel did not give me the feeling that they had a genuine interest in me. I searched the web using Accounting Aisle and was given a few contacts. After speaking to the principal at 212 Tax & Accounting Service, I decided to hire them.